Well I am starting to get tired of so many good albums. 77 is definitely an improvement over the 2 previous years, and there is still more good stuff to come. So here's another good album. There are many things to like here and a couple to gripe with. Peter Gabriel has shed the shackles of Genesis and so decides to show the world what he can do. He comes up with this album, while it starts with a song that could perfectly well be on Lamb Lies Down, he continues with Solsbury Hill, a truly great pop track. From there he touches all kinds of bases, from Rock to Blues to almost disco and power ballads. The album is all over the place. That said it is all good, it is touching too many bases for its own good, but it is doing it all very well indeed. 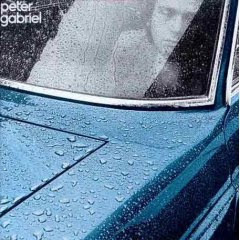 Fortunately all songs sound distinctly like Peter Gabriel even if they are in all these different styles and that gives some kind of coherence to the album. This is a really good collection of songs, each individual track is great but it is just that, a collection of great songs, there is little coherence to the whole thing. Gabriel proves that he can do a bit of everything, he just didn't need to do it all in the same album. Still it is pretty nifty and I will be adding it to my mp3 player nonetheless, after all this ranting it is still getting a 9. I am just angry because I love him. Gabriel and producer Bob Ezrin assembled a team of talented musicians, including Robert Fripp of King Crimson, to record the album. The album's second track, "Solsbury Hill," describes Gabriel's departure from Genesis and has become one of Gabriel's more popular songs. Erasure covered the song in 2003 on Other People's Songs. I really love Peter Gabriel's earlier work, this album in particular. I was a late bloomer, picking him up on the So album, but hey...better late than never. FYI, I am currently listening to, and reviewing Trafalgar which I figure will irritate you to no end. Say what you want though, dude, "How Can You Mend A Broken Heart" is a damn catchy tune.